Your Secretary can lighten your office administration workload, add value to your business and work in partnership with you, leaving you free to grow your business. Authors, editors, entrepreneurs, small business owners and one man bands often need a secretary - not to make the coffee but to help out with the paperwork. A good secretary can save you time and money. You'd be surprised how much help you can get for your business, from the correct spelling of your documents to the organisation of your filing system. Your Secretary is a completely flexible clerical, administration and typing service that works for you only when you need it. It's entirely up to you whether you use the service once, occasionally or regularly. 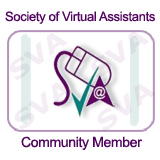 Why choose a Virtual Assistant? Sickness, holidays, sitting around in downtime. You get 9 to 5 support without paying 9 to 5 hours. (See calculation on Services and Rates page). That all important first consultation is Free. An initial consultation is vital. It can be done via email, Skype or face to face. This is where we get to know what we can do to add value to your business. A Virtual Assistant is an independent business owner and will have several skills to help you achieve your business goals. We are experienced administrators and can handle a variety of tasks from keeping your database up to date to posting your blogs.